The Waverley kayaker’s trip to her third Olympics this summer in Beijing wasn’t everything she’d hoped it would be, as she did not medal, but she was happy with many of her races. “Competition was up and down,” says The Coast’s 2007 Best of Halifax cover star. 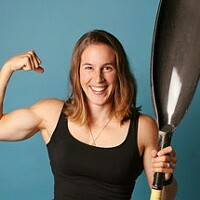 “Some days you make it into the final and some you don’t.” Still, she won the women's K1-200 at the Canoe-Kayak Knockout competition in Toronto in September, and has already begun training for the 2009 World Senior Canoe-Kayak Championships that take place on Lake Banook in summer 2009. And the break from competition over the winter will bring new challenges: “I’m in the job market for the first time in a long time,” she says.